Worldwide tiger populations have fallen from over 100,000 in the early 1900s to 3,200 today. Carefully managed zoo-based breeding populations through the Tiger Species Survival Plan (coordinated by Minnesota Zoo staff) serve as a “genetic lifeboat” for endangered wild populations. As you might imagine though, it can be quite a logistical challenge to bring together pairs of genetically valuable adult tigers from different zoos for mating. And even then, many pairs that look good on paper don’t end up being a good match behaviorally. Artificial insemination (AI) could improve breeding success for incompatible pairs of this endangered species and allow transfer of genetic material between zoos or countries without requiring transport of living cats. However, AI success in tigers historically has been very low with only three known pregnancies have been produced using AI in the past 20 years (from more than 60 procedures). Veterinarians Drs. Bill Swanson (Cincinnati Zoo) and Colleen Lambo (Omaha’s Henry Doorly Zoo and Aquarium) have worked to develop more effective AI procedures, and conducted AI with 11 female Amur tigers in 2011 and 2012. 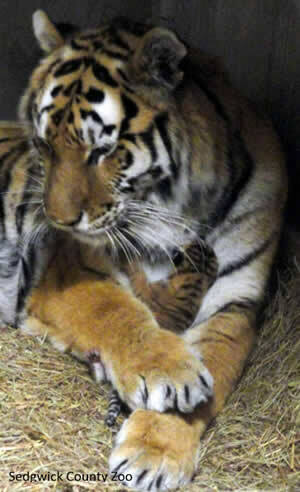 These new procedures produced a pregnancy Sedgwick County Zoo, and a single cub was born on 24 February 2013. Though the cub unfortunately did not survive, it represents the first tiger cub produced using the new laparoscopic oviductal artificial insemination technique and represents a significant advance. This grant was championed by Dr. Tara Harris, the Minnesota Zoo’s Director of Conservation, Tiger Species Survival Plan Coordinator, and Co-convenor of the Amur Tiger Global Species Management Plan. Learn how you can help wild tigers at www.mnzoo.org/tigercampaign.